Winners should be receiving their copies in the next few days. Don't forget that if you do get one you will need to add your thoughts and reviews* (marking any spoilers clearly) on this thread by the end of October. "In the media there has been a lot of speculation about who Hendrik Groen could be. Is he an actual octogenarian? Is he a famous Dutch writer? A well-known Dutch stand-up comedian? He remains anonymous, and the only thing that his publisher has revealed is that he is currently writing another diary." How do I go about entering for one of the monthly books? Anyone got the book yet? Tizliz you have to wait for the announcement and fill in the form. Usually towards the end of the previous month, but lately the books have arrived rather late. Good luck! Still no sign this month's book then and so I am living in hope. Still no copies for anyone? Can GNHQ give publishers a nudge? No sign of this one, I'm applying for the November one now! Has the system broken down? It's on today's newsletter greenfinch. I think this book looks more interesting anyway. Good luck to us both ! Rosie21 If you look a couple of posts above, Pittcity has put a link to the November Book Club. You just fill in your details. Good luck. Thank you for The secret diary of Hendrik Groen, just been delivered. I do enjoy receiving the books and commenting. Thanks for my copy. Look forward to reading it. I was pleased to receive my copy this morning. It looks interesting and I am looking forward to reading it. Just received my copy - thank you. Looking forward to a good read. I have received a copy and have already read the first couple of pages as it looks such an inviting book. 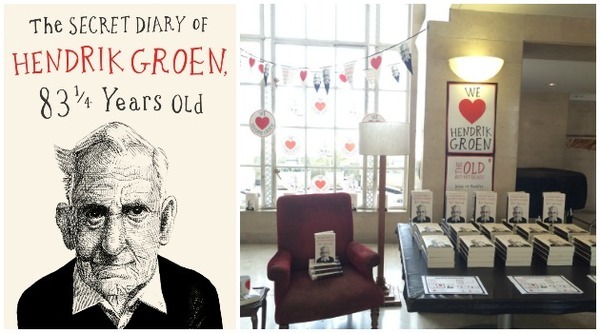 The copy of "The Secret Diary of Hendrik Groen" has just landed through our letter box. I had forgotten that I had applied for it, so a lovely surprise. Will start it when I have finished my current book. How long do I have before I post a review? I got my copy this morning also and am looking forward to starting it - looks like one I shall enjoy. Thank you GN.